next to Stradbally Parish, was part of the Roman Catholic Parish of Stradbally. moved to Liberty Street where they lived for the rest of their lives. buried in St. John's Old Cemetery (located directly behind St. John's Church) in Middletown, CT.
death certificate. Esther was born circa 1785 in Stradbally Parish, Queens County, Ireland. husband, Edward, in St. John's Old Cemetery, Middletown, CT.
Scully, son of Martin & Jane (Cavanaugh) Scully. The following files require Adobe Acrobat reader to open. has over 100 photographs of family members. 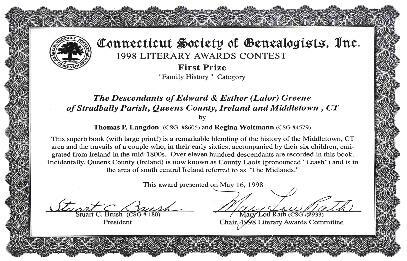 Literary Awards Contest in 1998.
may send notice to us on the 'Contact Us' page.